Our six hour bus trip from Luxor across the barren deserts of Egypt was uneventful. Not one shot was fired by the armed escorts. we didn't even see any signs of life much less terrorists. 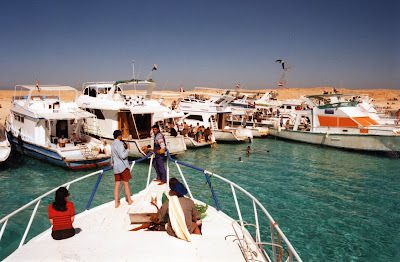 We rolled in to Hurghada on the coast of the Red Sea late in the afternoon. The next day we wandered around the hotel for the day and I checked out the scuba diving program. Because of my YMCA certification the wanted me to do a check out dive in the pool which I did and passed with flying colors. I'll have to get a more recognized certification some day. (see Canary Islands re-test) The next day we were on for a series of dives on several reefs and lunch in the dive boat. We were out on the pier early ready to take off. All we need was our cameras and our personal things. Everything else was supplied on the boat. It would be a a couple of hours cruise on the boat to the 1st dive spot then lunch on and island then another dive at another location. 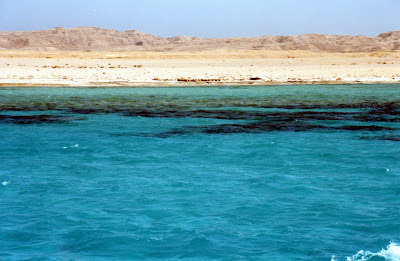 The first thing you will notice when you get on the Red Sea is that outside of very narrow corridors of population in a few cities there is nothing. As far as you can see there is beautiful turquoise green waters and white sand devoid of anything, but a few boats cruising the Sea. One of the most memorable events of the week on the Red Sea was a day we decided to walk to the center of town from our hotel compound. It appeared to be a couple of miles on the map and it was a beautiful day so we set out along the beach road. Most of the road to town was occupied by hotel compounds similar to ours. However as we got closer to town it became obvious that this was indeed still part of Africa and other than the hotels and diving Hurghada was really a backwater. We walked to the center of town where there was located a duty free shopping center that catered to the tourist industry. As always when walking in Egypt if you are a foreigner you will get bothered for money by the "skinners" and here was no exception. After shopping it was getting late and dark so we opted to take a cab back the 3 or so miles to the hotel compound. Cabs in a third world country can be interesting. The one we managed to flag down was falling apart, and the doors were wired shut. There also seems to be this strange custom on country road in Egypt to shut off the head lights when driving. They seemed to think that they were saving electricity or something. But they would only turn the lights back on when they were about to pass an oncoming car. The ride back in the dark going to fast with no lights in a falling down cab proved to be "Interesting". We did however made it back safely to our compound. Other than the diving we lounged by the pool had great meals and relaxed.